As demonstrated in an earlier article dealer or sales commissions can easily be calculated with the .NET Calculation Engine finaquant® calcs. Control the variation of selected inputs; Sales and Commission Scales. Reporting: Visualize the resultant total commissions with plot diagrams. The commission scale (lower limit) amounts of the scale table are increased or decreased in proportion for all commission contracts. C#/.NET code below shows how the Calculation Network is configured for the simulation with two variable table-valued inputs: Sales and Commission Scales. 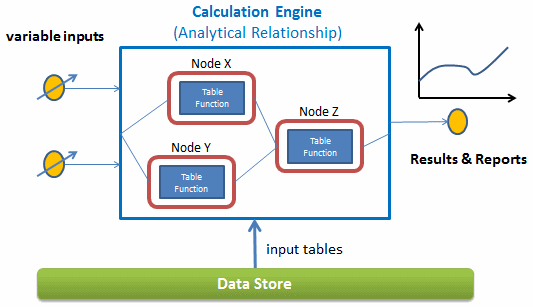 Other inputs of the Calculation Nodes are fetched from the external database as before. 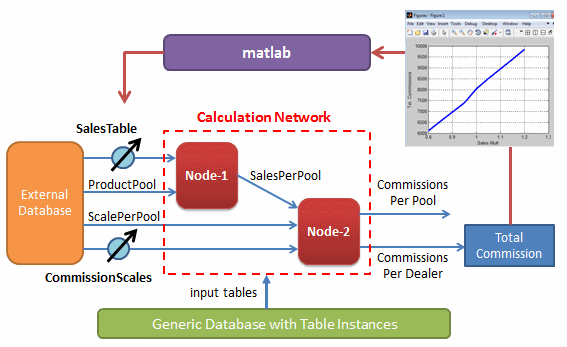 In Simulation Mode, not input or output table is stored in the generic database. You may find all the C# code examples presented here in the Visual Studio project file FinaquantCalcsStarter (Demo Functions for Getting Started) beginning from release 1.02 (see related downloads at finaquant® calcs). String ExtConnStr = @"Data Source=(LocalDB)\v11.0;AttachDbFilename="
string connStr = @"Data Source=(LocalDB)\v11.0;AttachDbFilename="
C# method for calculating Total Commissions for given pair of Sales and Scale multipliers. The output table Commissions per Dealer is aggregated to obtain total commissions for all dealers. Simulation method that receives two equal-sized NxM input matrices, SalesMult (sales multipliers) and ScaleMult (scale multipliers) from Matlab, and returns NxM output matrix TotalCom with total commissions for each multiplier value pair in input matrices. // Method called from Matlab: Execute Network for all input values, and return a matrix of results. // Execute Network for all input values, and return a matrix of results. The simulation method above that expects matrix inputs can also be called directly within C#/.NET; we need an additional software like Matlab especially for data visualization (plots, graphs etc.) and reporting. Following matlab script illustrates how the simulation function in C#/.NET is called from matlab to initiate simulation and display the results in graphs. See Calling .NET Methods in Matlab for general information about the integration of Matlab and .NET. This demonstration shows generally how the Calculation Engine finaquant® calcs implementing any analytical relationship can be used for simulations. Note that this simulation example doesn’t make much sense from the business perspective. However, it can be used as a technical prototype for any kind of simulations. The Calculation Engine could represent any analytical relationship, or mechanism that is based on table data, like Dealer or Sales Commissions, Performance Fees, Financial Plans; in fact Estimations and Predictions about anything in business and science. Ability to simulate means also ability to optimize. Optimization functions of software like Matlab could be used for this purpose. This entry was posted in Calculation engine, Fee and commission calculations. Bookmark the permalink.